Conservatory Planning Permission and Building Regulations are two different issues in the planning and building of a conservatory and should not be confused even though your Local Authority manage both. Since the changes in 2008, with respect to planning, there is no difference between a single storey solid roof extension, a conservatory, an orangery or a tiled/slate roof garden room. Properties that have not already been extended have Permitted Development Rights, although these are not applicable if it is a Listed Building, in a Conservation Area or Area of Outstanding Natural Beauty. You will find a comprehensive guide to making a Planning Application at the government Planning Portal. Along with an application for Planning Permission you will need to supply a Certificate of Ownership, an Ordnance Survey based Location Plan and a Design and Access Statement. Sometimes there is also a requireent for a flood risk assessment. These regulations came into force on the 1st October 2008. You will need to satisfy all of the following when considering any development within your residential property. or other alteration of a dwelling house. NOTE: This rule has been changed for a period of three years from the 30th May 2013 to allow, in many cases, single storey extensions up to 8m on a detached house and 6m on other properties. There are restrictions and you should read the detail on the Planning Portal. This is known as the neighbour consultation scheme. (iv) an alteration to any part of the roof of the dwelling house. (c) the enlarged part of the dwelling house would have more than one storey and extend beyond the rear wall of the original dwelling house. (c) where the enlarged part of the dwelling house has more than one storey, the roof pitch of the enlarged part shall, so far as practicable, be the same as the roof pitch of the original dwelling house. (b) a container used for domestic heating purposes for the storage of oil or liquid petroleum gas. (i) the capacity of the container would exceed 3,500 litres. development is not permitted by Class E if the total area of ground covered by buildings, enclosures, pools and containers situated more than 20 metres from any wall of the dwelling house would exceed 10 square metres. E.3 In the case of any land within the curtilage of the dwelling house which is article 1(5) land, development is not permitted by Class E if any part of the building, enclosure, pool or container would be situated on land between a wall forming a side elevation of the dwellinghouse and the boundary of the curtilage of the dwelling house. E.4 For the purposes of Class E, “purpose incidental to the enjoyment of the dwelling house as such” includes the keeping of poultry, bees, pet animals, birds or other livestock for the domestic needs or personal enjoyment of the occupants of the dwelling house. “ORIGINAL DWELLINGHOUSE” – means the house as originally built, or as it was on the 1st July 1948. Check that previous owners have not already altered the house. (f) a World Heritage Site. If you live in a newer property your permitted development rights may have been removed by your Local Authority issuing an Article 4 Direction. If you live in a listed building and wish to add a conservatory to it, you must obtain Listed Buildings Consent before construction starts. It is a criminal offence to carry out work that requires Listed Building Consent before this has been given. A listed building is a building of special architectural or historic interest, included on a national list compiled by English Heritage. Step One: Contact your local council before you make an application. You can discuss your proposed application with the planning officer and get some indication as to whether or not your proposal is likely to be accepted. This is certainly cheaper than making a full application and you may get some advice as to how a full application may be viewed more favourably. Step Two: If you haven’t done so already, ask your architect, conservatory designer or installer, for their ideas about how to make your application more acceptable. Working with someone who has been through the process several times before and who knows how to answer, negotiate and overcome objections can save you time and money in the long run. Designs in keeping with the style of your home using similar materials often have the best chance of being approved. Wood and glass conservatories are considerably more acceptable than plastic and polycarbonate erections, which will always be rejected! Being indigenous, oak framed structures are looked on favourably. Step Three: Ask your local authority for the forms you need for making an application. This will need to show clearly what you intend to do and should be accompanied with detailed plans and photographs. In most cases the local authority will deal with the application, but more important cases may be referred to English Heritage and sometimes to the Secretary of State for the Environment, Transport and the Regions. It can take up to eight weeks or more after sending in your application for a decision to be sent to you. If consent is denied you have six months during which you can appeal to the Department of the Environment, Transport and the Regions. A conservation area is an area of special architectural or historic interest. They are designated by local authorities to help preserve and enhance the character and appearance of the area. Once an area has been given conservation area status, it does not mean that everything should be preserved exactly. It’s the character of the area that is most important. So if you are restoring an old conservatory, it will usually have to be done in the style of what was there previously, using acceptable materials; and if you are building a new conservatory it should be built in a way that does not harm the area’s special character. A planning application for a conservatory in a conservation area normally needs to be made in detail, rather than in outline so that the full impact can be taken into account before a decision is taken. If you haven’t done so already, take time to read what we have written about applying for planning permission for Listed Buildings and follow the advice there about discussing your plans with Planning Officers and getting the help of architects, designers and installers. Your permitted development rights in an AONB are reduced from the standard development rights. The limit is usually 50 cubic metres or 115% of the total volume of the property whichever is greater, when measured to the outside of the planned conservatory. If the property has been extended before, their size will need to be deducted from these allowances. 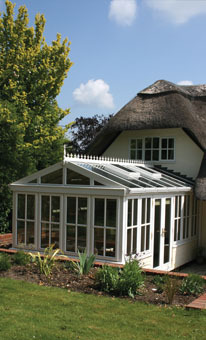 For a conservatory larger than what is outlined here, you will need to apply for Planning Permission. If some years after the original conversion has been made you wish to add a conservatory the same proviso applies. However, while permission to extend is slim you should check with your local council to find out what they may accept. If the original conversion was done sympathetically and your planned conservatory is built using local materials you may have a chance of being accepted. The size of the conservatory may also be taken into consideration, so local knowledge and the advice of architects and builders may help you in your application. Flats and apartments have no automatic right to have a conservatory added and planning permission advice should be sort from an architect or a designer or builder with knowledge about these matters before any work is considered. You will find a comprehensive guide to making a planning application at the government Planning Portal. You can use the links on the Planning Portal site to make your application and pay your fees. A good conservatory company will be able to deal with all these matters on your behalf, usually for a very reasonable low charge. If permission refused; change proposal and submit new application. An experienced conservatory designer or installer can help you with this process to ensure that it goes as smoothly and as quickly as possible within the eight weeks time frame. Along with your application for planning permission you will need to send a Certificate of Ownership. There are two types of these, firstly one when you are the owner; secondly a certificate when you are not the owner. Most councils will allow you to download a Certificate of Ownership for you to complete from their website. For a new conservatory requiring planning permission you will need to supply an accompanying Ordnance Survey based location plan at a scale of 1:1250. The plan must show your property with the proposed conservatory marked on it to scale and all adjoining buildings and roads, including those at the back and those facing your property. This process is easier than it once was, as it is now possible to buy a plan of your existing property and the surrounding area from an internet site recommended by Ordnance Survey. A Design & Access Statement (DAS) is now a requirement for most planning applications and all applications for Listed Building Consent. A DAS is a paper that explains the design thinking behind the application, in order to demonstrate that the applicant has carefully thought through how the proposed conservatory is appropriate to its surrounding area. There is no special format to it and there is no official form you need to fill in, but it should be relevant to the application and can contain plans or photographs where appropriate. The DAS has to be submitted at the same time as the planning application forms and fees are submitted to your local council.